The Ampex sign off Highway 101 in Redwood City. It's a sign of the times, literally and figuratively. An iconic sign of innovation in the Silicon Valley is being dismantled. 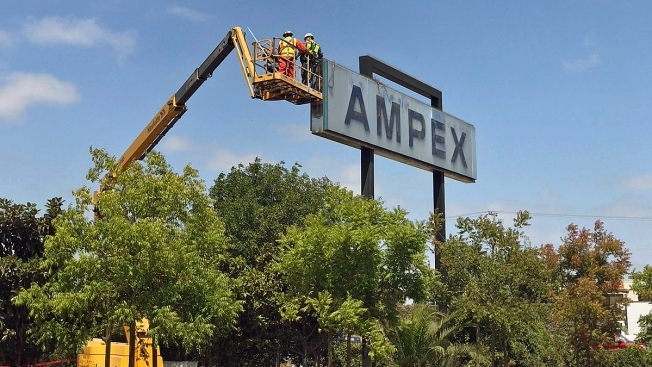 The Ampex sign, seen for decades right along Highway 101 in Redwood City, is coming down despite an effort to save it. In the early days of Silicon Valley, Ampex was a king. Many of the ways we consume TV, sports and music are credited to Ampex patents. It pioneered audio recording and the tape recorder, thanks in part to former executive Mark Sanders. "About 50 major companies. If you look at these geneology charts of Silicon Valley, the one for media and technology, it all comes from Ampex," Sanders said. He and many other Ampex employees are puzzled as to why the iconic sign that marked the site of the old headquarters is being removed this week. "To take down the last remaining symbol of that is a true tragedy," Sanders said. The city says the sign was not determined to be of national historical significance, which would have protected it. The property is owned by Stanford University as part of it's satellite campus. The letters on the sign already came off by Thursday and were placed into storage at the university. "We also offered the sign to Ampex, Who vacated the property years ago," a Stanford spokesman said. "To date, no one has offered to take the sign." Former Ampex employees include the founder of video game maker Atari. Sanders says none of the ex-employees he's talked to knew about the issue. "I think they would have designated it a historical landmark had they known there was any risk," he said. Sanders now hopes the piece of Silicon Valley history Will find new life in the valley it helped build. "Driving up and down 101 and seeing that sign is still important," he said. "Whether the sign is in that exact spot or some place nearby."